Does it have stripes? Does it roar instead of neigh? Well no, but the Tiger Horse is certainly worth roaring about! The history of this colorful easy gaited breed is the history of Europe and the New World. These horses carried conquerors and the conquered and carved new empires out all across the world. Thirty thousand years ago, unknown artists painted their horses, wearing rope halters, in caves in Spain. These horses, members of the huge "proto warmblood" herds which roamed Europe, are the base upon which the Spanish Jennet was built. Over the millennia various infusions of blood from northern climates, the Orient, and North Africa gradually produced horses of smooth gait and great pride. When Ferdinand came to the Spanish throne, he passed the "Gentlemans Law", which stated that "All Gentlemen must ride stallions". This law intensified the breeding of horses which had great presence, but were gentle and docile in nature. These influences insured that the Jennet was so highly regarded by the European horsemen of the 15th through 18th centuries that, in 1593 Salomen de al Broue, Horsemaster to Henry IV of France wrote: "Comparing the better horses in order to appreciate their greater perfection, I must place the Spanish at the top and give it my vote for being the most noble, the best conformed, the bravest and the most worthy of being mounted by a Great King." Horses in these wild color patterns were referred to by the Spanish as Caballo Tigre, or Tiger Horses. By the time of the English colonization of the New World, however, the Tiger patterned horses had begun to lose favor in the face of the influence of the English Thoroughbred, and many Tiger Horses were exported to the Canadian colonies as trade goods. The Native Americans appreciated horses, and dearly loved all the wildest color patterns, which helped to preserve the Tiger Horses. The Ni Mee Poo (Nez Perce) Tribe of the Pacific Northwest has been singled out and erroneously credited with developing the spotted horses found so frequently in the Northwest. The Ni Mee Poo themselves, however deny that they developed this breed, but they did love them and traded to acquire them whenever possible. Tigers figured strongly into their breeding programs, which were perhaps the finest of any of the Native American Tribes. Not only did they acquire Tiger horses from Canadian traders, but Tribal oral history also tells of special stallions bought from Russian traders, which were pushed off boats, and swum ashore by tribesmen. Some have felt that because these horses were obtained from Russian traders, they must have originated in Russia. Extensive research by historical experts has shown no evidence of Russian importation of any livestock. It is much more likely that these "Ghostwind" horses were pure Spanish, obtained by the Russians from the Spanish in California, where the Russians established farms. Thus, the breeding programs of the Ni Mee Poo were heavily influenced by the blood of the horse "Most worthy of being mounted by a Great King." The excellence of the Ni Mee Poo horses, due to the Spanish influence, is recorded in the journal of Merriweather Lewis, written during the Lewis and Clark expedition in 1804. Lewis wrote: "Some of those horses are pided with large spots of white irregularly scattered and intermixed with the black, brown, bay or some other dark color, but much the larger portion are of a uniform color with stars, snips, and white feet, or in this respect marked much like our best blooded horses in Virginia, which they resemble as well in fleetness and bottom as in form and color." It must be remembered that at the time of the Lewis and Clark expedition, there was still a strong influence in the colonies of the British Hobby, and the Narragansett pacer was quite popular. Both these well known breeds had a strong Spanish Jennet influence, so it is no wonder that Lewis, himself a horse breeder, recognized the quality of the Ni Mee Poo herds. One of the most notable traits retained by Tiger Horses was the ability to perform an intermediate four-beat gait, or, as it became known later, the "Indian Shuffle". This comfortable riding gait was so much easier on horse, rider and equipment that cowboys would pay as much as $50.00 more for a "Shuffler", and this at a time when a good broke cowpony would go for around $30.00. In 1877, war between the Ni Mee Poo and the U.S Army brought the conquest and relocation of the Tribe, and the nearly total dispersal of their huge herds of horses. Many of the Tiger type horses were still to be found in the Pacific Northwest, due to the fact that they had been well distributed among the Native American Tribes by trade, and some ranchers either owned some, or held portions of the Ni Mee Poo herds against the eventual return of their rightful owners. In 1938, Claude Thompson, an Oregon farmer established a registry to preserve the spotted horses believed to have been developed by the Ni Mee Poo. While the credit for development of these horses was misplaced, the founding of the Appaloosa Horse Club did bring attention to these horses, and prevented their total extinction. Unfortunately, the ApHC embarked on crossbreeding programs, using Arabian, Thoroughbred, and Quarter Horse bloodlines, which have all but eliminated the original characteristics from the Tiger Horse. There have remained, however, pockets of the original type in Canada, remote areas of the Pacific Northwest, and in those herds held in trust by ranch families for the Ni Mee Poo. In addition there have always been breeders who adhered to "Foundation" breeding, and have regularly produced horses of the ancient Spanish type and four beat gaits. In 1991, two individuals, brought together by chance and the desire to learn of the origins of the four beat gait in their Appaloosas, began what turned into three years of intensive research into the real history behind these horses. When a significant amount of information was discovered that directly contradicted the accepted Appaloosa history, it was decided that a new organization was needed to find, preserve and perpetuate what was left of the ancient Tiger type horses. This led, in January of 1994, to the official launch of the Tiger Horse Association. The first four years were difficult, including many personal setbacks for the original Directors, and the breaking away of a former member who established the unaffiliated Tiger Horse Registry. Despite the setbacks, the dedication of Tiger Horse aficionados was firm, and in 1998, the Tiger Horse Association incorporated, and now, on the eve of the new millenium, is now poised to launch an all out campaign to find and register as many horses that still resemble the ancient type as possible, to ensure their survival into the 21st century. In order to understand exactly what should be looked for, a comprehensive breed standard was developed with the invaluable assistance of such experts as Dr. D. Phillip Sponenberg of the Virginia Tech College of Veterinary Medicine, expert in color genetics and Spanish Horses; Deb Bennet, Ph. D., horse historian and conformation expert; as well as many members of the Ni Mee Poo Tribe who contributed oral history to the research. Dr. Gus Cothran and the University of Kentucky is doing the blood typing and D.N.A. work for the association to assure the proper parentage records and the genetic health of the Tiger Horse Breed as well as charting the advances made toward the establishment of a true breed. As base foundation stock, the Tiger Horse Association Inc., is actively seeking all horses which display the Tiger Horse characteristics of Leopard Complex (Appaloosa) color patterns, an even four beat intermediate gait, and at least some Spanish conformation characteristics. 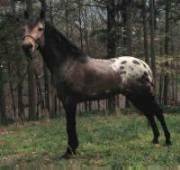 These horses can come from the Appaloosa breed, Spanish Mustang, any of the Paso Breeds, Native American herds, wild horse herds, or some of the less well known Spanish based breeds, such as the Florida Cracker Horse. This system was put in place to assure that the Tiger Horse will always be what the Spanish and the Native Americans knew and loved, a superior, beautiful, working, travel horse! All horses accepted for foundation registration will of course show the ideal combination of conformation, gait and color. The offspring of registered Tiger Horses may not all, however, show the color traits. These offspring are still fully registered Tiger Horses, but they will not be accepted in the Model Category, therefor they will not be eligible for a Permanent Championship. Thus, the Permanent Champion horses will be the ideal toward which all breeders can strive, after proving not only their color heritage, but their gaited working ability also. No horse, which does not clearly show an intermediate four beat gait, will be accepted for registration. Due to the fact that the ability to gait has been actively bred out of the Leopard Complex horses, it is understood by the Tiger Horse Association Inc., that outside gaited blood must be brought in to strengthen the gaiting ability of Tiger Horses. The wholesale outcrossing which has been the downfall of so many other breeds, destroying the very characteristics the breed organizations were supposed to protect, will not be allowed by the Tiger Horse Association, Inc. All outcrossing will be one generation only. The Tiger Horse Association Inc., exists to provide an organization to find whatever remnants are left of the type of horse known as a Tiger Horse, as described in the Official Breed Standard. To register and protect these individuals. To promote the Tiger Horse breed through whatever means available. To encourage the perpetuation of the breed. To offer an award program designed to recognize outstanding horses and to promote the versatility of Tiger Horses. To act as an information source for Tiger Horse Association members, and the general public to improve knowledge of the Tiger Horse Breed. The Tiger Horse Association Inc., is a not for profit organization. 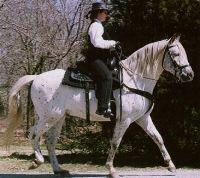 The Tiger Horse is an easy gaited saddle horse breed with a color preference. 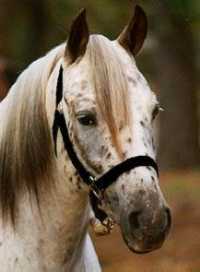 As a direct descendant of the Spanish Jennet, the Tiger Horse, like its modern Spanish-American relatives, has a distinct Spanish conformation, a comfortable to ride four beat gait, and as an added bonus, the striking color patterns also found in such modern breeds as the Appaloosa and Noriker horses. El Caballo Tigre has a long proud history which stretches back into the mists of antiquity in Spain, and, in the New World, changed the course of history for Native Americans. These smooth riding, colorful horses have come down to today in sheltered pockets almost unchanged, and the Tiger Horse Association Inc., exists to ensure that they will survive for future generations to enjoy. The information in this section is kindly provided by the Tiger Horse Association. Please choose this link to learn more about this striking breed.